I hadn’t really realized how much I miss all the fall gardening that we usually do until I was going through some pictures from the last 2 years. It makes our garden this fall seem pretty sad. I’m sure the tomatoes are the main culprit for the sadness. These two plants toppled over in the wind a couple days ago. They just got too top heavy with all the growth and fruit at the top, and then the wind knocked them over. Luckily, it seems like no harm was done. I stood them up and stuck a couple posts in the cages to help hold them up. 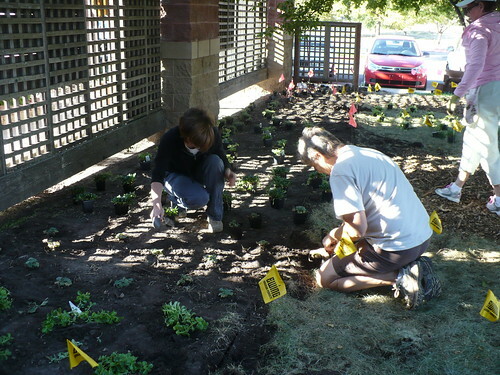 Some of the Master Gardeners worked on planting a new shade trial garden this week. We have several different types of ornamentals and grasses that we are testing for K-State to see how well they do in a situation where they are competing with tree roots in a non-improved soil. 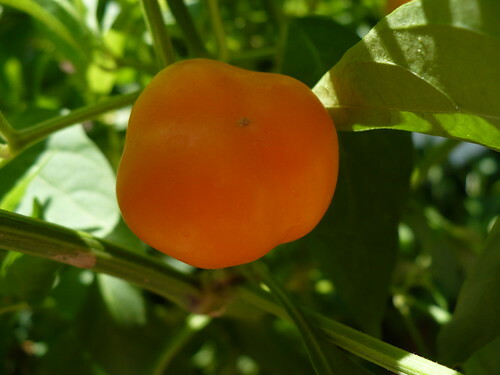 The Mini Belle Peppers are fairly prolific, although the fruit are still about 1/2 to 1/3 the size I think they should be. They probably need more fertilizer, but they aren’t going to get it. Isn’t that orange color beautiful, though? 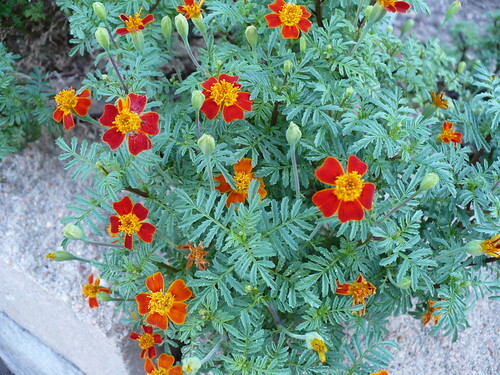 Last year, the citrus marigolds just keeled over in the heat of summer. This year, the plant didn’t look very good for most of the summer, but it is finally holding its own. I love the lacy foliage with the tiny blooms. I did try eating one (yes, they’re edible), and it wasn’t bad. But not quite good enough for me to dig out that citrus marigold sauce recipe. I haven’t shared as many cooking adventures this year, but here’s a picture of one interesting experiment. 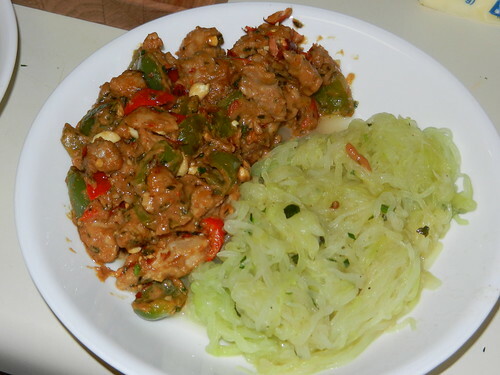 This is a Peanut-Pork Satay with lots of peppers, and instead of noodles or rice, we made Cucumber Noodles. Yes, that’s right – that slightly green pile of noodles is 100% cucumber. (Well…probably 98%, by the time you account for butter and seasoning.) We sliced the cucumbers into noodles with a mandolin slicer, blanched them in boiling water, drained them, then sauteed them in butter. They were pretty good! 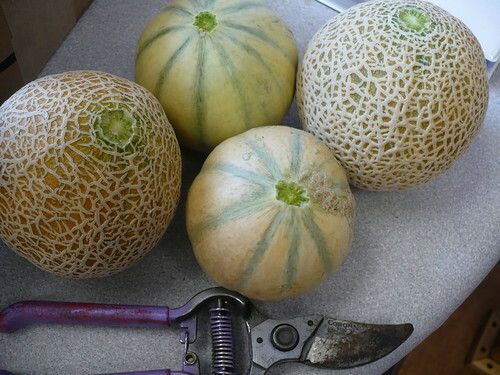 Here are 4 of the 5 melons we picked this week. They are pretty small, and unfortunately, not very tasty. The small ones tasted over-ripe and mealy. The larger ones were better, but still not as sweet as we might have wished. Have a great weekend! Next week – Garden Demolition! 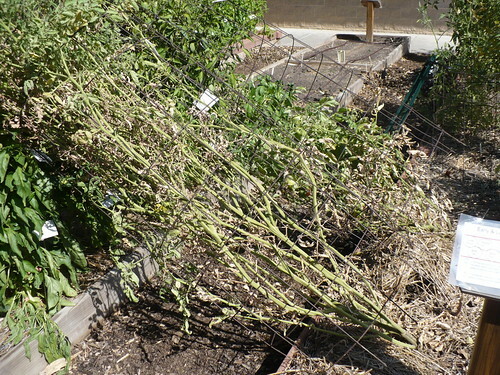 Posted on October 7, 2011, in PhotoEssays and tagged cooking, cucumbers, flowers, herbs, melons, shade garden, Tomatoes. Bookmark the permalink. 1 Comment. I am usually not a cucumber fan, but I would like to try cucumber noodles. -Ruth N.